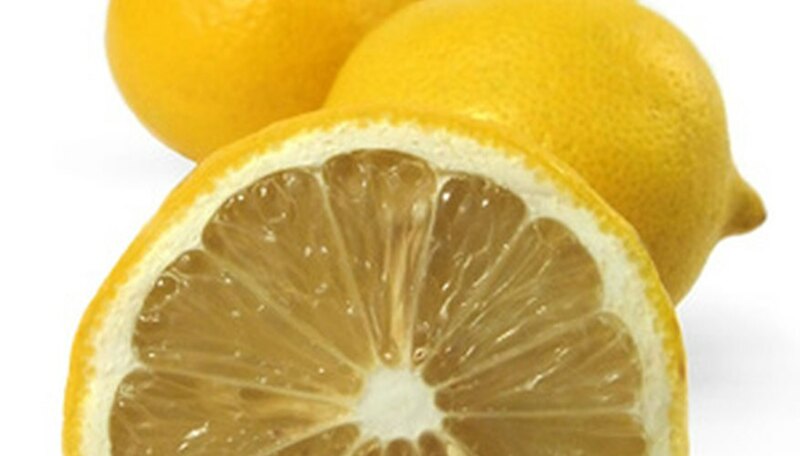 The Meyer lemon is a hybrid citrus fruit developed from crossing a lemon with a Mandarin orange. While not considered a true lemon species, the fruit is used in identical ways. Meyer lemon is an ever-bearing, evergreen citrus tree that becomes fruit-bearing at three to five years of age and produces the bulk of its harvest-ready fruit from December to April. It has the same cultural requirements for fruiting as true lemon and benefits from well-drained soil and applied fertilizers in the form of either foliar sprays, organic soil amendments or synthetic fertilizers to keep producing substantial harvests. Provide a mildly acidic to acidic growing soil for your Meyer lemon, with a pH ranging between 5.5 and 6.5. Amend soils of higher acidity, meaning 5.5 or lower, with lime to boost the alkalinity. Amend neutral and alkaline soils above 6.5 with elemental sulfur to boost the acidity and lower the pH. Overly alkaline soils can result in iron or manganese chlorosis, which disrupts photosynthesis and eventually can affect bloom and fruit development. Meyer lemon thrives in relatively poor soil conditions and therefore responds to organic soil amendments that boot the quality and fertility of the soil much as it would respond to chemical or organic fertilizers. In lieu of fertilizer products, Meyer lemon can be fed with heavy top-dressings of organic manure, quality compost and a final layer of organic mulch once or twice each year. The nutrients in these materials are washed into the soil when watered and will break down into the soil, gently feeding the tree over time. Spread several inches of organics over the entire root zone, starting five to six inches out from the trunk, to prevent mildew or rot, and water in well. Chemical fertilizer products can be applied three times each year from mid-fall through the end of spring. Choose a citrus tree fertilizer containing equal parts nitrogen and potash. Apply according to the product label dosing directions but do not exceed 10 pounds of fertilizer for every year of age of the tree, in any one calendar year, for each tree up to 50 years of age. Meyer lemon benefits from nutrient sprays applied directly to the leaves of the tree for direct uptake of nutrients. Copper- and urea-based citrus tree sprays are the most commonly used. They are applied after flowering has finished in the spring, in keeping with the product dosing directions. California lemon growers prefer using urea instead of ground fertilizers to prevent the buildup of fertilizer salts in the soil or contamination of area groundwater.